Pallet Renew provides customer pallet design and drawings using Pallet-Track Drawing System. This system provides an accurate breakdown of design specification, material and cost tailored to individual client requirements. Pallet Renew provides additional branding services for all types of pallets. Allowing for ease of identification for various applications. 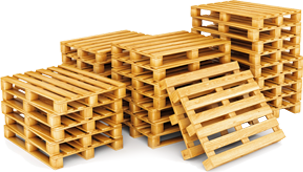 Under-utilized pallets can be stored and transported to our facilities on an as-need basis. If you have any type of excess pallets, contact a customer service representative to answer your questions about pallets.